■ [Recurrent Nova] U Sco outburst !! We have performed a time-resolved spectroscopic observation for therecurrent nova U Sco for around two hours on Jan. 28. The data reductions were performed according to a standard procedure using IRAF. The wavelength calibrations of the spectrum were obtained using an emissions line of a sky background of the object. The obtained spectrum shows the strong and broaden emissions line. A peak of an emission due to H_alpha seems to be the structure composed to the three component from the H_alpha. The H_beta also shows such a conspicuous structure. These Balmer series lines show the P-Cyg prifile with the blueshifted absorptions. These features indicate that the opacity of the expanding shell was still the optically thick at this time. We can discuss the geometry of the shell of the outburst of U Sco. We update the light curve of Type II SN 2009kr. 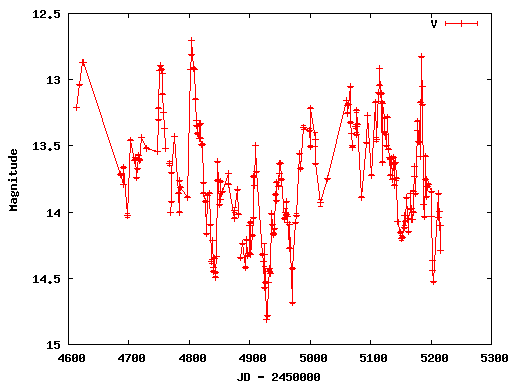 We update the light curve of Type II SN 2009js. We update the light curve of Type Ia SN 2010B. We update the light curve of Type Ia SN 2009na. We update the light curve of the optical transient of UGC 2773. 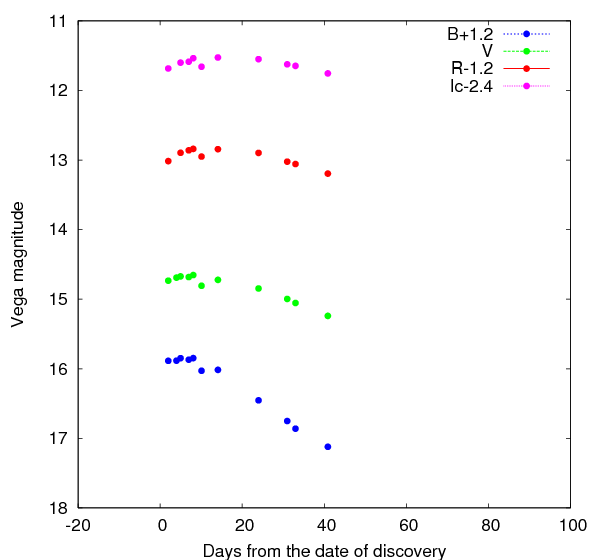 We update the light curve of Type Ia SN 2009nr. We update the light curve of the optical transient in UGC 2773. 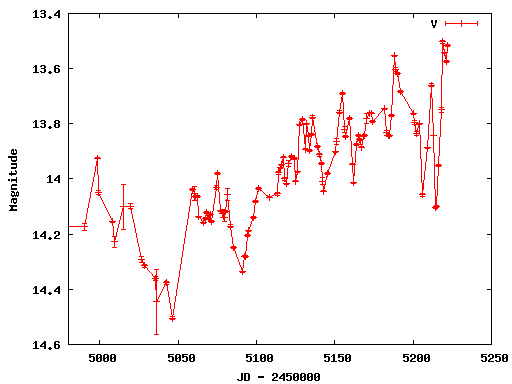 We update the photometric results of Type II SN 2009js. The photometric results still show the rapid decline of the light curve. We continue the observations of this object until the luminosity reached photometrically limiting magnitude. The object has recently been bright rapidly. The amplitude of magnitude was about 0.6 mag in V band. Recent brightness of the object was the brightest state for 2 years. We update the light curve of Type Ia SN 2009na. The light curve show a sharp secondary maximum. It indicates that the intrinsic luminosity may be a bit lower than that of a normal SN Ia. We update the light curve of optical transient of UGC 2773. 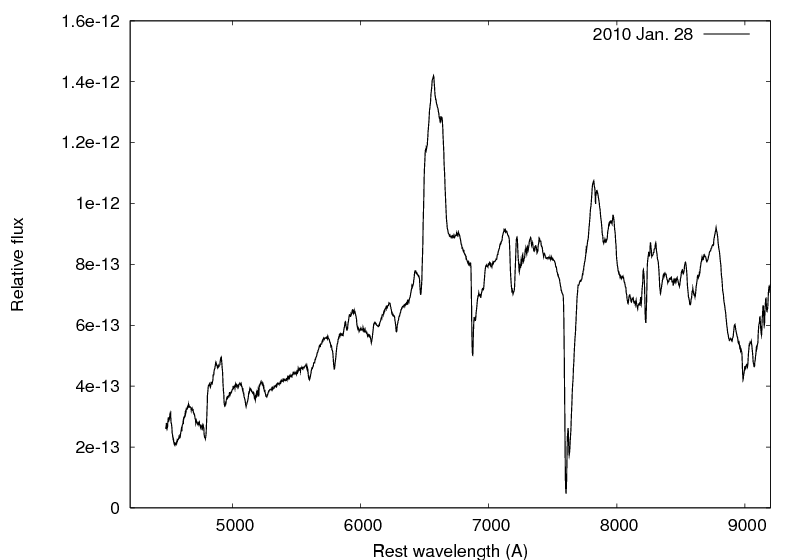 A recent photometric observation of Super-Chandrasekhar SN Ia 2009dc was updated. We could not directly measure any flux from the object in the image obtained by the imager HOWPol attached to 1.5m Kanata telescope. We estimated the upper limiting magnitude of SN 2009dc as 20.9 mag from the V-band image. In order to check the corrections, we performed the photometry of faint star near SN. 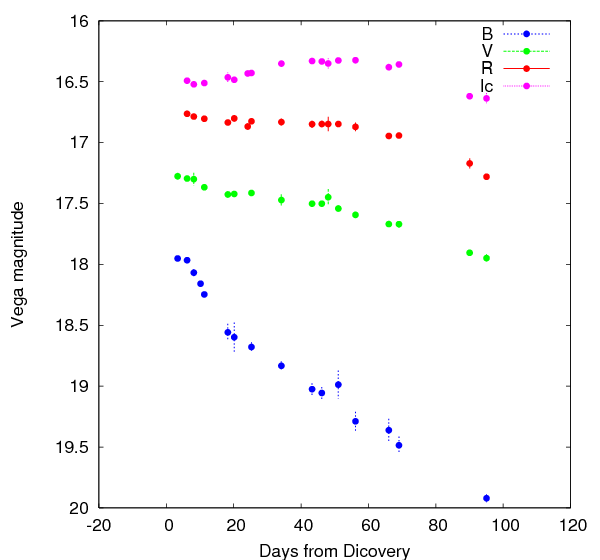 We derived the luminosity of the faintest star as 20 (+/-0.5) mag. It seems to be consistent. The obtained d magnitude indicate that the luminosity would decrease according to the radioactive decay of Co in ejecta as a normal SN Ia. 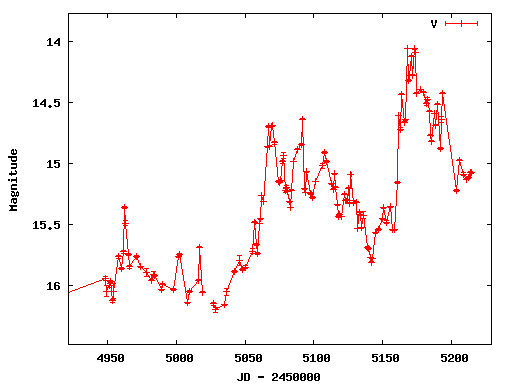 We update the light curve of Type II SN 2009js. The V-band light curve indicate that the rapid decline of the luminosity has already begun and the plateau phase ended. This phenomena is interpreted as ending the diffusions of the hydrogen shell. Thus, we can derive the mass of the hydrogen shell in the expanding ejecta from the term of the plateau phase. We update the light curve of Type Ia SN 2009kk. We update the light curve of the object in V band. The object has recently been faint and about V~14.2. We update the light curve of Type Ia SN 2010B. 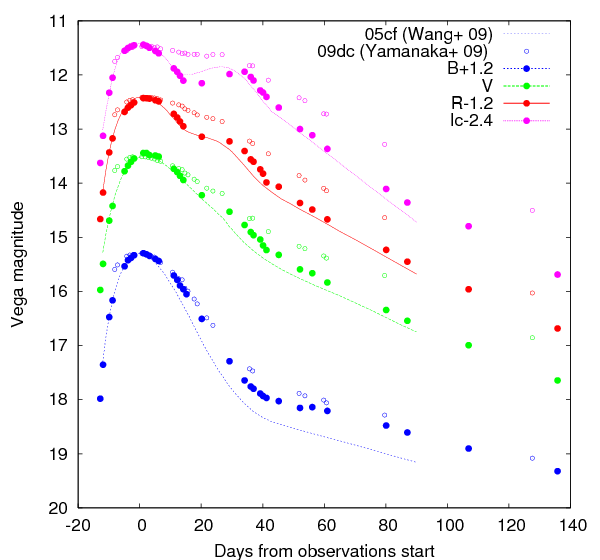 The obtained light curve indicate that the color rapidly become red. In the I band, the luminosity have been already increased, despite of the spectroscopically identifying of maximum light on Jan. 9 (5 days before our starting observations). 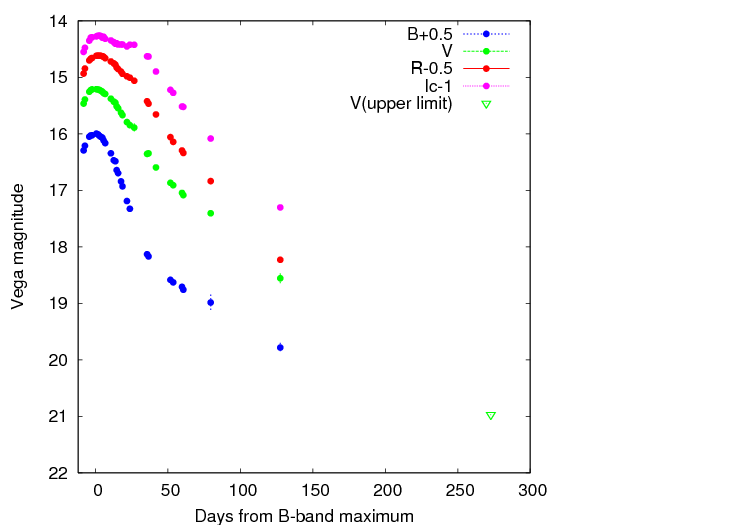 It indicates that SN 2010B has evolved from the minimum to the I-band secondary maximum. 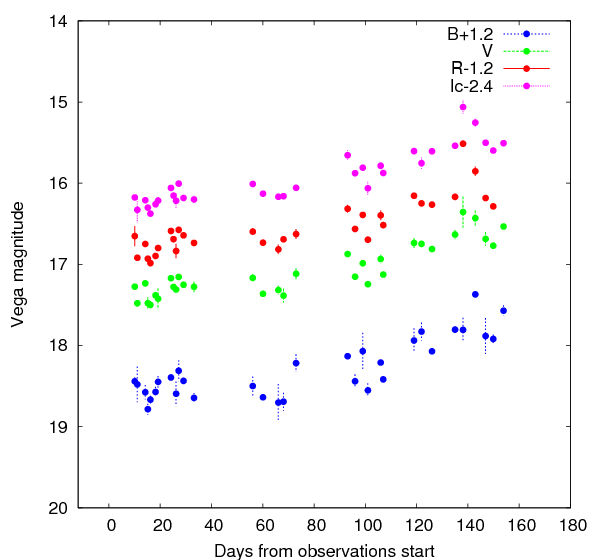 The B-band light curve show the faster decline than other bands. These observational fact suggests that SN 2010B may be classified into the rather slightly faint subclass than a normal SN Ia. We will continue the photometric observations in order to derive the decline rate of the late phase for searching the origin of the intrinsic luminosity. We update the light curve of the optical transient in UGC 2773. The light curve in all bands indicate that the luminosity seems to be in rapid decline. 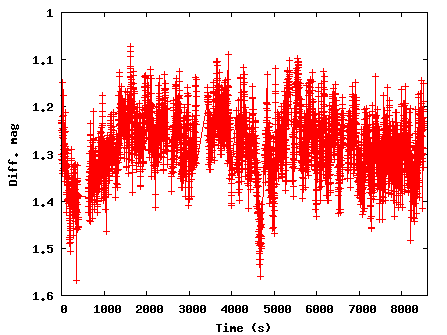 The decline rate of the V-band light curve show the 0.03 mag in a day. Especially, the decline of the luminosity is pronounced in the R and I bands. The color simultaneously became red with beginning decline of the luminosity. The only R band luminosity increased at this time. Thus, the emission line of H_alpha strengthen associating with the increasing the luminosity. This rapid decline may be only in a short time. We will continue the photometric monitoring this object. The object has been faded and reached about 17.4 mag. The object has gradually been bright since JD 2454800. We update the data of the object. The object was faded compared with JD 2455170. We have performed the photometric observations of Type Ia SN 2009nr. Unfortunately, due to the bad weathers in Higashi-Hiroshima, the plotted data became sparse. We will continue the observations of SN 2009nr. We have performed the extensive photometric observations of Type Ia SN 2009ig. 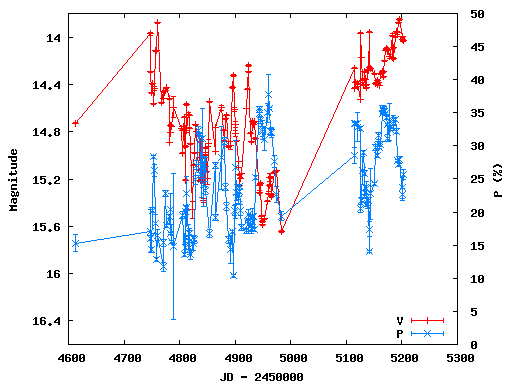 The light curves are compared to a very normal SN Ia 2005cf (Wang et al. 2009) and an extremely luminous SN Ia 2009dc (Yamanaka et al. 2009). The B-band light curve clearly shows an excess from that of a normal SN Ia. The luminosity obtained in B-band even reached that of the extremely luminous SN 2009dc. On the other hand, light curve of V, R, I-bands indicate that the luminosity rather become similar to those of normal SN Ia 2005cf than those of SN 2009dc. We will perform observations of the peculiar SN Ia 2009ig until an observation limit of this season. We performed high-speed photometry of the dwarf nova, V455 And on 17 Jan 2010 with a time-resolution of 2 s. V455 And experienced a WZ Sge-type superoutburst in 2007. This object is also known as an intermediate polar, whose spin period of the white dwarf is 67 s. The figures show our preliminary results: the light curve (the upper panel) and power spectrum (the lower panel) in 17 Jan. The features of the light curve and power spectrum are almost same as those observed on 23 Sep 2009. The object is still slightly brighter than the quiescent state observed before the 2007 superoutburst. We will continue the observation of this object to find a possible change in the structure of the power spectrum. We have performed the photometric observations of Type Ia SN 2010B since 2010 Jan.14 UT. SN 2010B was discovered of 14.4 mag at NGC 5370 by Tsuboi, M in Hiroshima (CBET 2115). Thereafter, the spectroscopic observations of this object was performed by Kinugasa, K. et al. reported in CBET 2117. This object was identified as a Type Ia SN before B-band maximum light. Unfortunately, since we obtained the photometric points an week after the maximum, the light curve already show the decline of the luminosity. 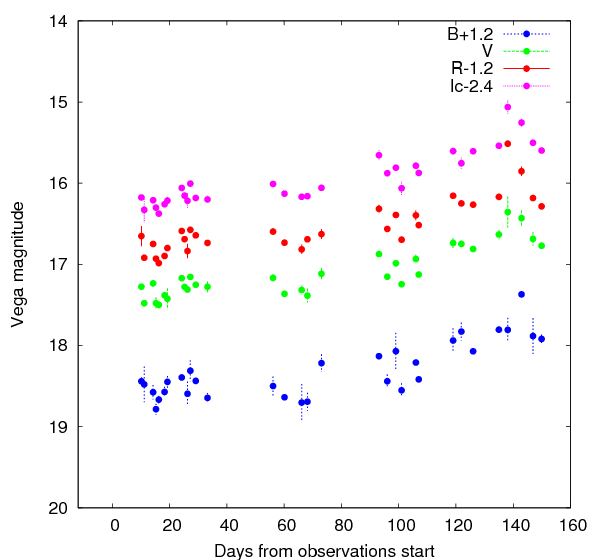 The decline rate of the B-band light curve seems to be faster than that of a normal SN Ia. We will continue the observations of SN 2010B. We update the light curve of Type IIP SN 2009md. We update the light curve of Type IIP SN 2009ls. The light curve of this object is well corresponding to that of a Type IIP SN. We will continue the observations of SN 2009ls. We update the light curve of Type II SN 2009kr. The luminosity still shows the flat shape of the light curve, which seems to be similar to that of a Type IIP SN. We have performed the photometric observations of SN 2009na since 2010 Jan. 6. SN 2009na was discovered of 15.3 mag at Dec. 26.4 by Newton, J. and Puckett, T, reported in CBET 2098. 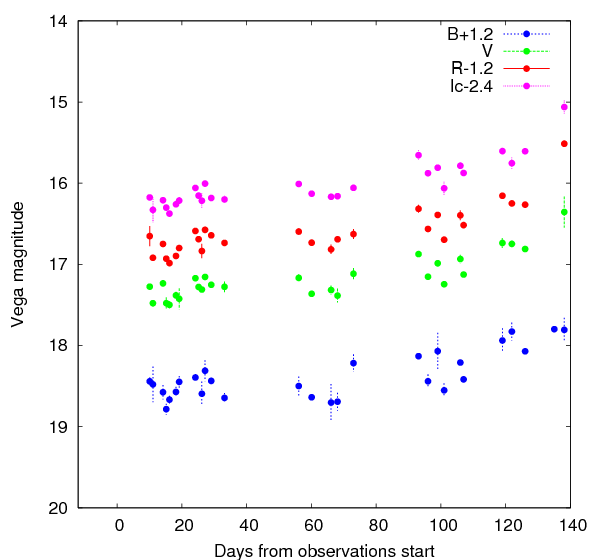 Thereafter, the spectroscopic observations were performed at Dec. 29 by Sahu ,D. K., reported in CBET 2103. 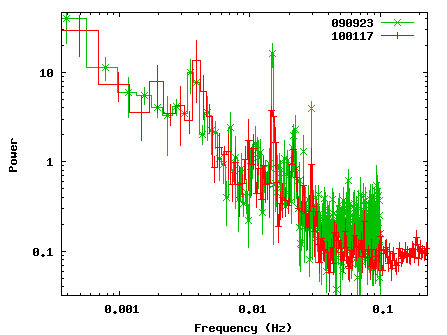 The spectrum shows it similar to that of SN 2003du before six days before maximum. We confirmed that the light curve already began to exhibit the decline of 0.3 mag per a week in B-band. The intrinsic peak luminosity derived from the decline rate of the light curve would be consistent with that expected from spectra obtained before maximum. We will continue the observations of SN 2009na. 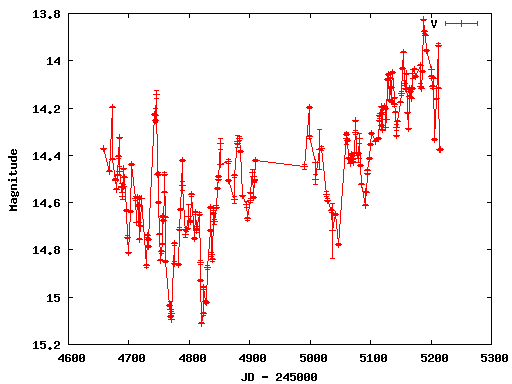 We update the light curve of Type II SN 2009js. The light curve would show of the rapid decreasing of the luminosity, which suggest that the recombinations of the hydrogen layer should end. 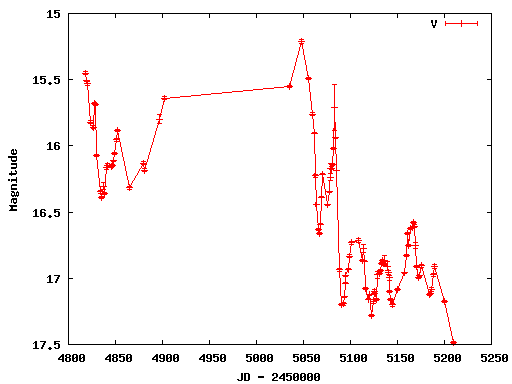 Assuming SN 2009js of a typical Type II SN, the decreasing magnitude is expected to be 5 mag. We will continue the observations of SN 2009js until a limit of a detection by KANATA/HOWPol. We update the light curve of the optical transient of UGC 2773. The luminosity rapidly increased and reached 15.6 and 15.1 mag in R and I bands, respectively. We will continue the observations of this object. We update the data of OJ 287. The object has been bright state, and reached V~13.94. The polarization degree continues to be high. We update the light curve of peculiar Type II SN 2009kr. The luminosity have increased in R and I bands. We update the light curve of Type II SN 2009md.